No trip through the American Southwest would be complete without at least one stop at a Trading Post and/or Gallery. 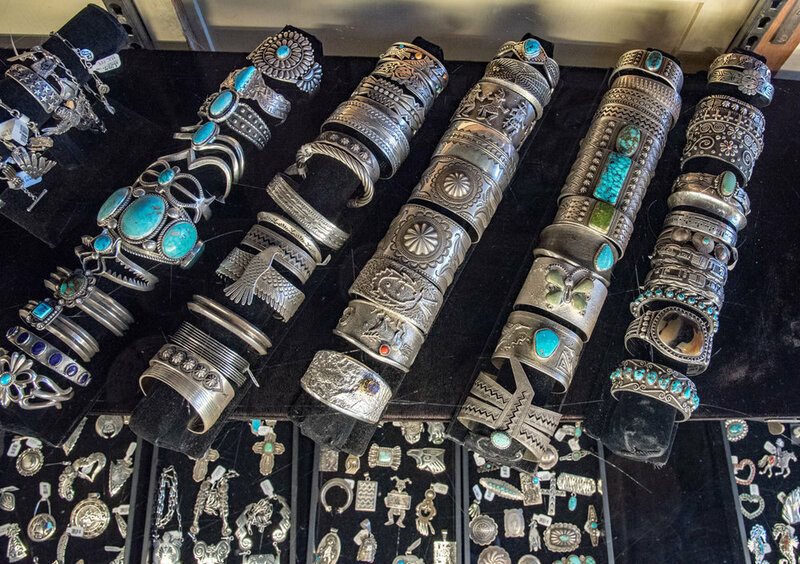 No matter if you are looking to purchase authentic Native American jewelry, pottery, or Navajo rugs or if you simply enjoy looking at these things, there are plenty of trading posts and galleries throughout northern New Mexico to indulge yourself. 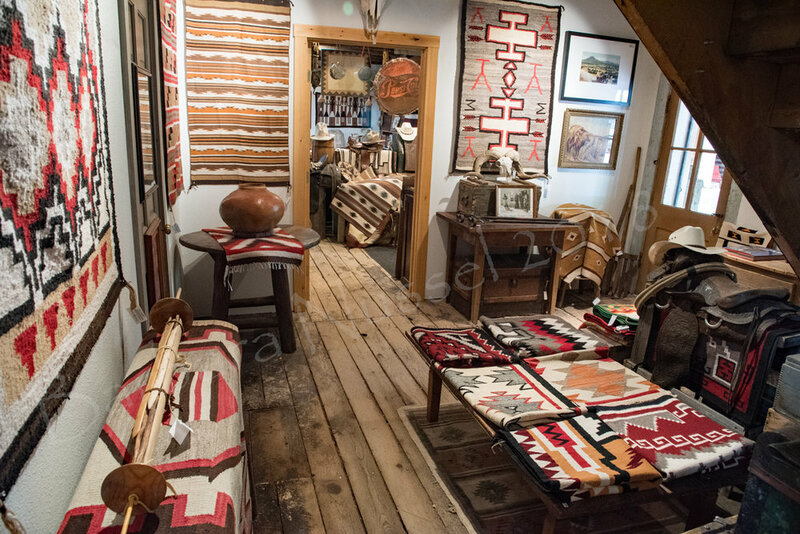 During the most recent of my travels among the mesas and canyons of Northern New Mexico I discovered not one, but two, fabulous places to look at amazing Native American Art, especially Navajo rugs. Traveling on the High Road from Taos to Santa Fe, I decided to take a quick detour from Espanola, to explore Abiquiu, where Georgia O’Keefe, the painter, had her home and studio. Across from the Phillips 66 gas station and Bode’s General Merchandise on Hwy 84, I took country road 187 up to the pueblo at Abiquiu, the location of Georgia O’Keeffe’s home. After wandering around I stopped at the open gate of the Bosshard Tribal Art Gallery to take pictures of an old cart. I had no intentions of entering the gallery as it looked expensive, but was approached by Bosshard’s assistant Jill, who encouraged me to come in and look around. I learnt that this building had been the original 19th-century Gonzales y Bode Mercantile, as well as the Abiquiu post office, before they were moved down to Hwy 84. When entering the main room of the gallery you’ll find yourself surrounded by amazing tribal art from all around Asia, but then Jill took me to the smaller rooms on the right side, and, oh my, I was in for an absolutely amazing experience! Two rooms beautifully decorated and filled with amazing Native American art and Wild West Americana. Saddles, and cowboy hats in all forms and shapes, even a hat which totally reminded me of the one Hoss Cartwright wore in the Western television series Bonanza. Apache burden baskets, Pueblo pottery, Navajo moccasins, old metal signs and wooden merchandise boxes, Pendleton blankets, historic photos, and lots and lots of Navajo weaving. I was awestruck. Between taking pictures and just wandering around mouth wide open, I must have been a comical sight. And then John Bosshard himself walked in with his latest Navajo rug finds. And let me tell you, he brought in some amazing pieces. I enjoyed listening in when John and his assistant Jill discussed the details of each piece. One of his finds was a Raised Outline Navajo rug, a weaving technique, where a ridge of weave outlines the design elements, and therefore allows paler background yarns greater distinction. It was my first encounter with this style of Navajo rugs. My visit with John and Jill was a true delight. Even though I didn’t purchase anything – and believe me, if I had the money, there were many, many items I would love to own from this gallery – their hospitality and no pressure antics made for a very memorable experience. John Bosshard was also the one who pointed me towards Toadlena Trading Post. 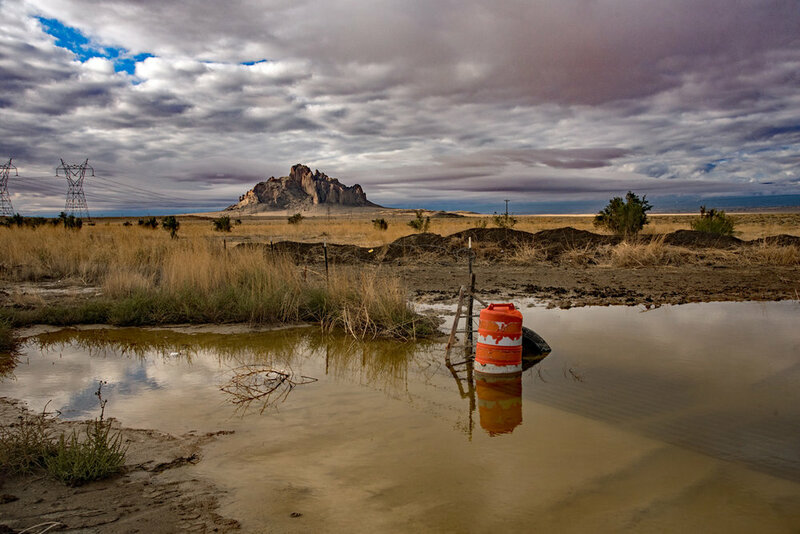 Toadlena Trading Post is about an hour south of Shiprock, NM on Hwy 491. Don’t listen to your Google Maps GPS, just take a right turn off NM 491 S at the Shell gas station, and the paved road (Indian Service Rte 19) will take you almost all the way to Toadlena. I followed the GPS, but refused to go through a flooded turn-off. The alternative turnoff at Newport took me on a 13 miles scenic tour through the Two Grey Hills area on various unpaved Indian Service roads (aka dirt roads). Toadlena Trading Post was built in 1909, and shortly after bought by George Bloomfield. Back at that time some traders had a significant influence on the development of certain Navajo rug styles. Juan Lorenzo Hubbell (Hubbell Trading Post), George Bloomfield (Toadlena Trading Post) and Ed Davis (Two Grey Hills Trading Post) were among those traders. 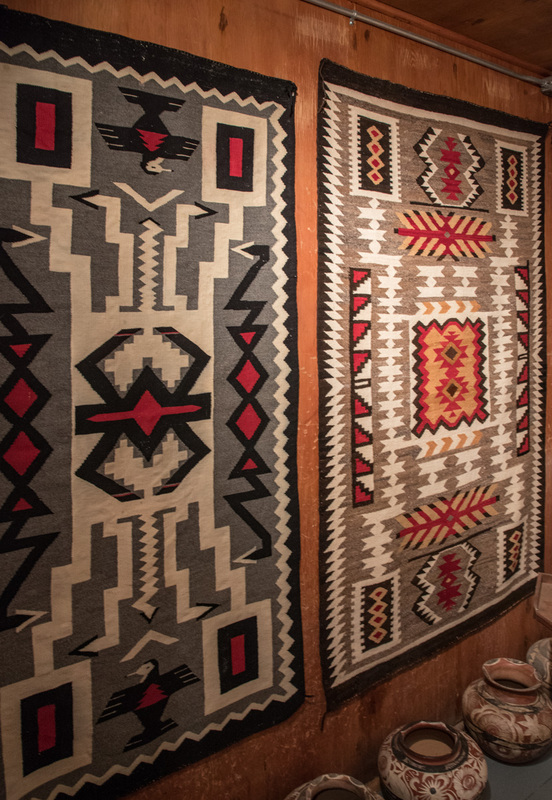 Together, Bloomfield and Davies played an important role in the development of the Two Grey Hills-style Navajo rugs. They worked diligently with the local weavers to develop a high-quality textile based on the weavers’ preferences for hand spun yarns in natural colors—a conscious contrast to the popular commercially dyed reds of the Ganado rugs at Hubbell Trading Post. The weavers in the Two Grey Hills area instead carefully combed and spun different natural colors of wool to yield a beautiful range of creamy whites, tans, browns, and greys. (To get a solid black color, weavers sometimes would overdye dark brown wool with black dye.) They developed very complex geometric patterns, usually based on a large, hooked central diamond with multiple geometric borders. They also were known for very finely spun wool of small diameter which they used to make very thin, dense, and tightly woven rugs that are certainly the greatest technical achievements in the history of Navajo rug making. Many of the women who weave for Toadlena Trading Post today carry on this tradition of quality. Toadlena Trading Post is still in its original building, but when the current trading post operator, Mark Winter, bought the rights to operate the historic Toadlena Trading Post from the Navajo Nation in 1997, he had to do quite extensive restoration work to bring back the old Trading Post. Toadlena Trading Post today continues to operate in the same way trading posts have since the 1870’s—dealing directly with the weaver and her family, and it still serves as a grocery store, bank, and post office for the local families. Entering the Trading Post, the front room is filled with groceries and other goods for local consumption, intermingled with videos, enameled cookware, and some arts and crafts items. Passing through a door on the left, you’ll enter two show rooms full of Navajo rugs, predominantly the local Two Grey Hills style, but you’ll also find a few other types. The lady working the Trading Post on my day of visit, inquired if I wanted to see the rug museum, and then unlocked for me the Two Grey Hills Weaving Museum, which Winter had added to the original Trading Post. The Museum is a small room off to the right of the main Trading Post room. It is filled with old photographs of weavers, weaver genealogies and some spectacular rugs. Each year since opening, the museum has hosted a major show of textiles showing the evolution of the Two Grey Hills style. During my visit the rug exhibit focused on different ‘storm patterns’, and there were some absolutely amazing rugs by one of the master weavers from that area, Bessie Manygoats, on display. Just for old times’ sake, on my way back west, I stopped at Hubbell Trading Post National Historic Site near Ganado, AZ. Hubbell Trading Post is the oldest continuously operating trading post on the Navajo Nation. It was purchased by John Lorenzo Hubbell in 1878, who established himself as one of the leading traders of his time. It was sold to the National Park Service in 1967, and is now operated by a non-profit organization that maintains the trading traditions the Hubbell family established. As I already described for Toadlena Trading Post, the traders back then had quite significant influence on the development of the Navajo rug styles. From the 1880s through the 1930s, reservation traders were the Navajos' primary contact with the outside world. As such, they also were the weavers' primary - or even sole - customers. Therefore, traders exercised significant influence on weavings simply by paying more for the designs, sizes, colors, and qualities they wanted. Of course, traders' choices were driven by what they thought they could sell to their off-reservation customers, but they also were guided by their own aesthetic sensibilities. As a result, distinctive styles of rugs emerged around several trading posts in the first years of the twentieth century. Such combinations of pattern and color are known as Regional Styles and are typically named after the trading post that encouraged their production. Juan Lorenzo Hubbell was, by most accounts, the leading trader of the early period in rug-making, and owned several trading posts around the Reservation. Hubbell's home and base of operation were at Ganado, Arizona about 50 miles south of Canyon de Chelly. His tastes ran to Classic Period weavings and many of the early rugs made by Ganado area weavers were close enough in appearance to classic mantas and serapes to have earned the generic name, Hubbell Revival rugs. Hubbell guided his weavers by displaying paintings of rug patterns he favored. Hubbell preferred a color scheme of red, white, and black, with natural greys. By the 1930s, Ganado area weavers had thoroughly adopted the color scheme, but had moved away from Classic-inspired weavings to new patterns with a large central motif-often a complicated diamond or lozenge shape-with a double or triple geometric border. These rugs frequently had a deep red "ground" or field on which the central motif was superimposed, and are now known as the Ganado regional style. 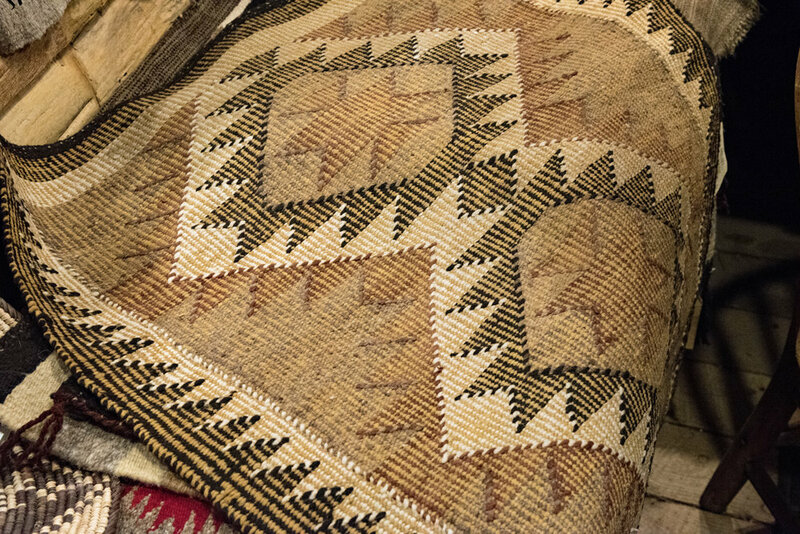 Weavers around the nearby trading post at Klagetoh, Arizona (also owned by Hubbell) often worked in the same colors and patterns, but reversed the color scheme and used a grey ground with red, white and black central motifs. 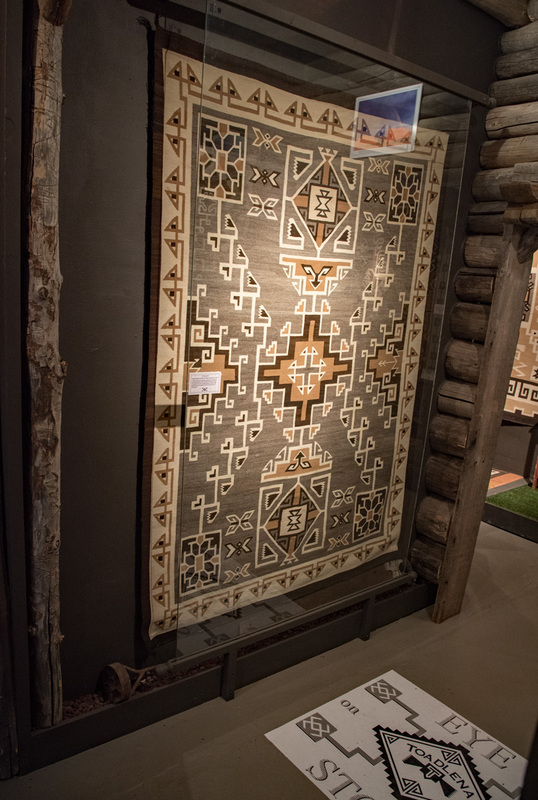 The Ganado and Klagetoh style rugs continue to be made to this day and are among the most popular of all Navajo rug designs.